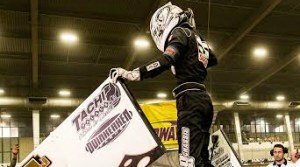 The 30th Speedway Motors Tulsa Shootout closed out with a bang as Michael Faccinto raced to his second Shootout victory in three years on Saturday. Evening his win total in the Outlaw divisions, the 2013 Non-Wing Champion gave chase at the start as four-time Tulsa Shootout winner Jerrod Wilson took the early lead. Running to slower traffic by the seventh lap, the Oklahoma Micro veteran saw his advantage slip as Faccinto worked to second from sixth. Racing to the back bumper of Wilson, the pair avoided catastrophe when the tail of the field saw two drivers collide entering the third turn on Lap 10. Underway, Wilson would daylight the field but just like before, traffic allowed Faccinto to close. Working near the twenty-fifth lap mark, Faccinto dove low on Wilson for the lead, only to collide with the No. 79J, sending both drivers flying towards the wall. Wilson was able to recover, while Faccinto bounced the No. 7J off the concrete; dropping the California shoe to fourth. Allowing Tyler Thomas and Kevin Bayer to race by, Faccinto regrouped with a damaged Jacobs Ladder and failing brakes. A few laps later, the race for the runner-up spot saw Bayer and Thomas coming together entering the third turn. Kicking Thomas to the infield, Bayer recovered in fourth as Faccinto raced back to the runner-up spot. Into the closing laps, Wilson sailed smooth in traffic, but with fewer than 20 laps to run, the No. 79J began slowing with mechanical problems finally sideling Wilson, giving Faccinto the lead, and ultimately the win. Giving California its third driller of the night, the evening saw Giovanni Scelzi earning his first driller in “A” Class. Giving the Panella family their second Shootout victory, Nikko Panella claimed his first win in the Tulsa Shootout, after his brother, Alex, topped Restricted “A” Class in 2014. Oklahoma drivers topped five divisions. Trey Marcham was the only driver to double up on drillers, taking his first Shootout win in “A” Class Non-Wing, before turning around and capturing another victory in Non-Wing Outlaw; leading start-to-finish in both feature events. Blake Hahn looked to be riding third in ECOtec Midgets before Cory Elliot collected leader, Zane Lawrence, exiting the second turn, opening the door wide for Hahn to race by for his sixth Golden Driller, and third in ECOtec. His first time behind the wheel of a 1,200cc Mini Sprint, Frank Flud rode the cushion around Jared Gunderson for his third Golden Driller in two years. Taking her first win in Restricted “A” Class, Kaylee Bryson of Muskogee, Okla. led non-stop to score a very popular win.